Surgical Diathermy is defined as the therapeutic generation of local heat in body tissues by high-frequency electromagnetic currents. 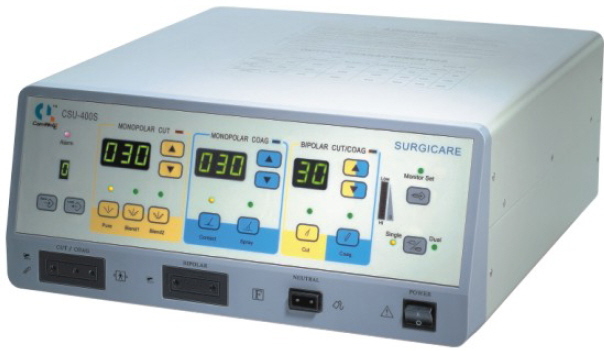 Also known as electrosurgery, surgical diathermy is a frequently used procedure that has been used in medical, dental and veterinary surgery for over two decades. Ultra high-frequency radio waves are transmitted through a fine wire electrode to a flat antenna on a ground plate. Principles of electricity are relevant in the operating room. The electrosurgical generator is the source of the electron flow and voltage. The circuit is composed of the generator, active electrode, patient, and patient return electrode. Pathways to ground are numerous but may include the OR table, stirrups, staff members, and equipment. The patient’s tissue provides the impedance, producing heat as the electrons overcome the impedance. The high-frequency radio waves pass through tissue and make a precise surgical incision just like a scalpel blade. The surgeon chooses from varying radio waveforms that result in varying degrees of pure cutting to hemostasis. The advantages of surgical diathermy are fine, precise incisions with hemostasis (a process which causes bleeding to stop). A key advantage is less blood obstructing the surgical field, making the procedure faster and easier. Though electrosurgery has been with us for decades, few surgeons have received formal training in its potential uses. The incorrect belief that electrosurgery techniques increase scar formation or weaken healing processes, has led surgeons to other methods to deliver energy to the living cell. The “trick” is knowing how to calculate and administer that energy is the challenge. As the technique became more widespread, there was a rise in the number of injuries and complications reported and especially, of burns directly associated with diathermy. These were generated by the increasing use, in the interest of patient safety, of other electrical devices, coupled with ignorance of current flow interactions brought about by the associated use of a variety of medical devices. The potential explosion of combustible gases in anesthesia, endogenous intestinal gas, the induction of arrhythmias and the effect on pacemakers as the result of alternating current frequency, create extra risks in electrosurgery. Additionally, muscle fibers can be activated by the direct electrical stimulation of diathermy and also by blocked motor endplates. This can lead to contraction of the major muscles, which may in turn be misinterpreted as insufficient anesthesia. The use of electrosurgical plasma to effect the incisions and coagulation of blood combines the advantages of the scalpel’s cutting precision and conventional coagulation capability, while minimizing collateral thermal damage. These advantages have been shown to result in stronger healed wound strength, equivalent scarring to a scalpel, reduced serous drainage, and lower inflammatory cell counts in healing incisions. Siemens, Storz, Valleylab, Wallach Surgical, Zimmer and many more.